This article talks about spiritual warfare, reconciliation, prayer, power. 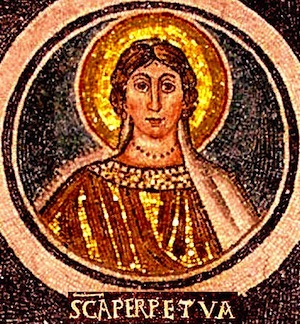 A wealthy Christian noblewoman at the end of the second century, Perpetua is the most famous female Christian martyr of the Roman Empire. St Augustine so admired her faith that he preached four sermons about her witness. Soon after becoming a Christian, she faced persecution from Emperor Septimius Severus, who decided in AD 202 he wanted to eradicate Christianity in North Africa. At just 22, with a small baby dependent upon her, Perpetua was arrested and ordered to deny her faith. Felicitas her slave-girl and several Christian men were arrested at the same time. Perpetua's diary contains a detailed account of their whole ordeal from house arrest to prison, with eye-witnesses recording the actual martyrdom. Initially Perpetua was under great stress in prison because she was separated from her unweaned baby. However, after two deacons succeeded in re-uniting mother and child, she records that she ‘became well’ straightaway, and ‘suddenly the prison was made a palace’ for her. Family tension brought additional hardship – her pagan father could not understand why she insisted on being a Christian and thought it selfish and proud. ‘Have pity on my grey head … Think of your child … Give up your pride!’ he exclaimed. In response, Perpetua said that everything would happen as God willed, and asserted that they were ‘all in His power,’ not their own. On the day of the trial, the group were questioned. Each refused to perform an act of Emperor worship, and declared their faith in Christ. Perpetua’s father rushed to her and pleaded, ‘Perform the sacrifice. Have pity on your baby!’ In the face of this, Perpetua remained steadfast, after which she and her friends were condemned to the wild beasts. In her diaries, Perpetua records many visions that God gave her during the persecution. In one of them, she saw a ladder with a serpent at the bottom, leading up to heaven. The serpent was attacking those climbing up the ladder, which suggested to Perpetua that she would have to spiritually fight Satan rather than just the wild beasts in the arena. Yet she was assured from the vision that she would come out victorious. Initially savagely attacked by a wild heifer, the Christians were later put to death by the sword. Witnesses described Perpetua as having a ‘shining countenance and calm step, as the beloved of God’ with her ‘intense gaze’ putting down everyone’s stare. Perpetua’s example has inspired generations of Christians to be bold in the face of persecution and to keep hold of our 'heavenly' perspective.